Mobile internet usage has long surpassed desktop and laptop usage, and not just in the consumer world. Though typically synonymous with a long and complex buying process, the B2B buyer’s journey has expanded significantly in recent years. And B2B buyers have become much more consumer-like in their behaviour. Reliance on the salesperson has reduced, with the majority of buyers no longer expecting to speak to someone until they are just about ready to close the deal. Social media has become a more convenient resource for researching potential vendors and solutions. 54% of B2B buyers are using LinkedIn for research, compared to just 20% in 2012, according to the CMI. And, mobile is playing an increasingly important role in the buyer's journey. With the rise of flexible and remote working, buyers are no longer tethered to their desks. The constant connectedness that smartphones offer means the lines between work and personal are more blurred than ever. It’s not just the millennials either, as research shows the trend towards mobile spans all generations of the workforce. The impact for B2B marketers is compelling. Mobile influences 40% of revenue for B2B organisations, according to research by Google and the BCG. The same study also found that mobile can speed up time to purchase by 20%, and that a positive mobile experience can increase customer loyalty. It’s impossible to ignore this growing influence of mobile in B2B buying and the opportunity this presents. This is why many marketers are embracing a mobile-first approach. A mobile-first approach requires an understanding of the role mobile plays at each point in the buyer’s journey. Data analytics can help us understand at what stage in the journey our prospects are using mobile versus other channels, and we can use this knowledge to develop strategies to engage them. There can be great value in interviewing buyers too. Talk to your current customers; they’ll be able to offer a greater depth of insight into how they used mobile behaviours in their recent purchase. Data analytics can tell you what’s happening. Your buyers can tell you the reasons behind their behaviour. And the ‘why’ behind the actions they take will help you better understand their needs so you can improve the mobile experience for prospects. Embracing a mobile-first approach is easier than you might think. First and foremost, buyers want a quick, efficient mobile experience and a more seamless encounter across channels. So a responsive web design is your first priority. This will ensure the best viewing experience possible, on not just mobile but all other devices too. When it comes to web content, think minimal text, concise headlines and shorter paragraphs. Your content needs to work in its most limited form so that when people visit your site, they can easily find what they are looking for. Emphasise videos and infographics that supplement your content too. Mobile users absorb visuals better than text. Landing page forms can be frustrating on mobile. Buyers will have less patience to complete long and wieldy forms, so don’t overburden them by asking for more than the essentials. Think about how emails differ on mobile compared to desktop too. Your emails need to work well on small, vertical screens. And create CTAs that are clear and easy to read with text that is short but to the point. The overarching theme here is to keep things direct and concise. Mobile isn’t going anywhere, in fact all the evidence seems to suggest it’s only going to become an even bigger source for B2B buyers. 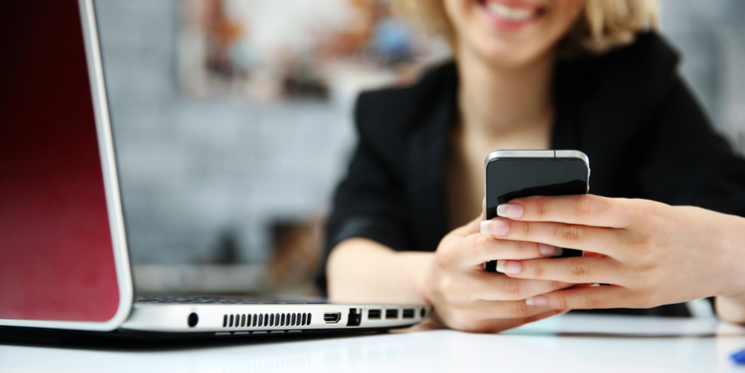 Creating a positive mobile experience that seamlessly connects with other channels should be an integral part of your marketing strategy.